Slots Craze - Enjoy the thrill of real Las Vegas slots with thousands of FREE coins every day, epic jackpots and huge wins! Are you ready for the biggest and best SuperBingos GamePoint has to offer? Join us today from 1-3PM ET for Mega SuperBingos in the 250 Coin rooms and up, where we'll add tons of Coins only to these SuperBingo pots! Simply be online in GamePoint Bingo and keep an eye on the chat announcements to find out where the next SuperBingo will take place. Starting 7PM ET, GamePoint's hosting an amazing in-game giveaway with fantastic prizes! Don't miss it and make sure you're online in your favorite game (any room). Yes! That's all you have to do for a chance to win one of our lovely prizes. Keep an eye on the chat to see if you're a winner! What would you like to win? Enjoy special Tournaments in RoyalDice all weekend long! No matter how many Coins you like playing with, there will be a special Tournament for you that includes EXTRA COINS that we're adding to the pot! Have fun in RoyalDice this weekend and don't forget to join us for our grand Easter giveaway on Sunday at 7PM ET for eggcellent real prizes! Collect eggs in GamePoint Casino to Win a Surprise! Turns out the Easter Bunny also likes playing in GamePoint Casino. Looks like the Easter Bunny had so much fun, some Easter eggs were scattered! That's where you come in: Collect them all to win a HUGE Slot Coin prize! Find all the eggs in the reels of your favorite slots within GamePoint Casino to win 500,000 Slot Coins! But hurry, you only have until Monday, April 22nd to find the Eggs! LIVE: Paint Easter Eggs with us! We're having so much fun celebrating Easter at GamePoint. So we'll be painting Easter Eggs and we invite you to join us! Today at 1PM ET (18:00 UK), catch us painting eggs LIVE while you play your favorite games. Hope to see you there! The Easter bunny is making a stop at GamePoint and has lots of treats in its basket for all our players! For every day of the event that you come back and play, we'll give you a special Easter egg. The more eggs you have, the BETTER your chances to win during our GIVEAWAY on Easter! The giveaway takes place across all games and all rooms, so you just need to be online on Sunday, April 21st at 7PM ET. We slipped a special Easter Egg into GamePoint Bingo! When you see this colorful egg roll by, all participants will get a FREE Bingo Card. We have some egg-celent news. There's an extra LIMITED TIME collection! Play in the 35 Coin rooms and complete the Easter-themed collection to get that prize! The Easter Bunny is making an appearance in your games! Play and level up a special Easter Bunny Cup. And our new VIP of the Week is GailMoore10! Congratulations! You win 1 extra week of (Super)VIP and 500 Coins for being our new VIP of the Week! Want to be the next VIP of the Week? Make sure you have a wonderful profile picture and keep your subscription up to date and you might see your picture here next. Come and enjoy extra special rounds in your favorite games at GamePoint as we treat you with Happy Hours, April 9-11! Feeling lucky in GamePoint Bingo or waiting for that big win in RoyalDice? Then this is your chance! Does this sound like a treat to you? Then join us April 9, 10, 11 at 1-4PM ET and 7-10PM ET, we're looking forward to seeing you! Love puzzles? Love GamePoint? Then you'll be in for a treat: We assembled the most skilled puzzlers here at GamePoint and starting Monday, April 8, we'll attempt to finish a 1500-piece puzzle within the week. The best part? You can watch us LIVE every day at 1PM ET on our Facebook page to watch and help us! And if you join us, you might even be lucky enough to win a fantastic GamePoint puzzle yourself! 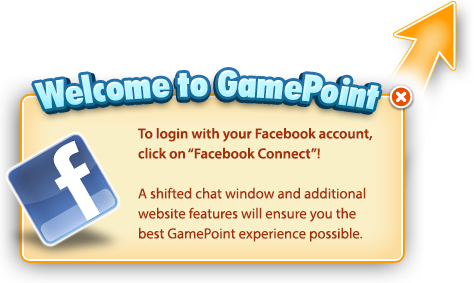 All you need to do is visit our GamePoint Facebook page and make sure you're subscribed and receive notifications. That way you'll get notified exactly when our live stream starts! Let us know if you'll be there! Last Card Free in GamePoint Bingo! When in Rome, do as the Romans. And that's getting the LAST CARD FREE when you buy ALL the cards in special Bingo rooms. When you buy all in rooms that have at least 6 Bingo Cards, (manual 1, 10, 25, 100 and all automatic rooms including the Turbo rooms), you won't be charged Coins for the last card. That's one extra chance for that WIN! What rooms will you be playing in this weekend?